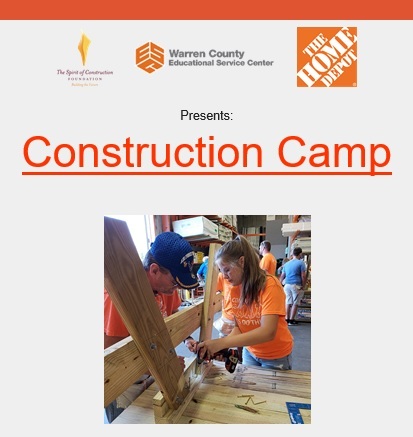 The Warren County Educational Service Center and Home Depot are offering CONSTRUCTION CAMP for students in grades 6-8. 8:30 a.m-11:30 a.m. & 12:30 p.m.-3:30 p.m. Learn from construction experts during both of these 4 half-day Construction Camps. Students in grades 6-8 will receive an introduction to construction including use of both hand tools and power tools, measuring & cutting, framing, painting & finishing. Using the tools that they will receive just for attending Construction Camp, students will build their own toolboxes and a birdhouse.